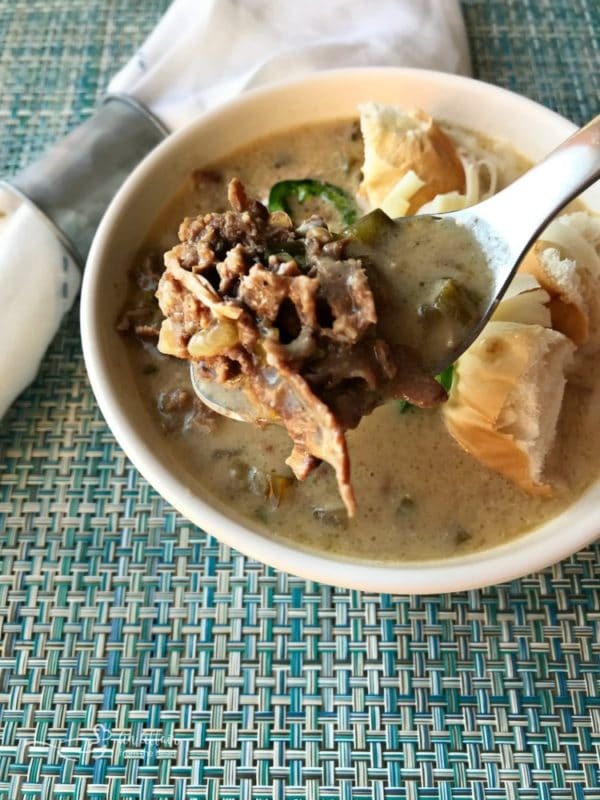 This Philly Cheese Steak Soup is one of those recipes, that once we ate it, we were already planning it’s next appearance on our menu. I make (and eat!) a lot of soup. Like a lot, a lot of soup. My love for it has definitely transferred over to my kids, too. So, when I tell you that my oldest son (who’s eaten my food the longest!) Told me that this soup is one of my top 3 ever made? I knew we had a keeper! 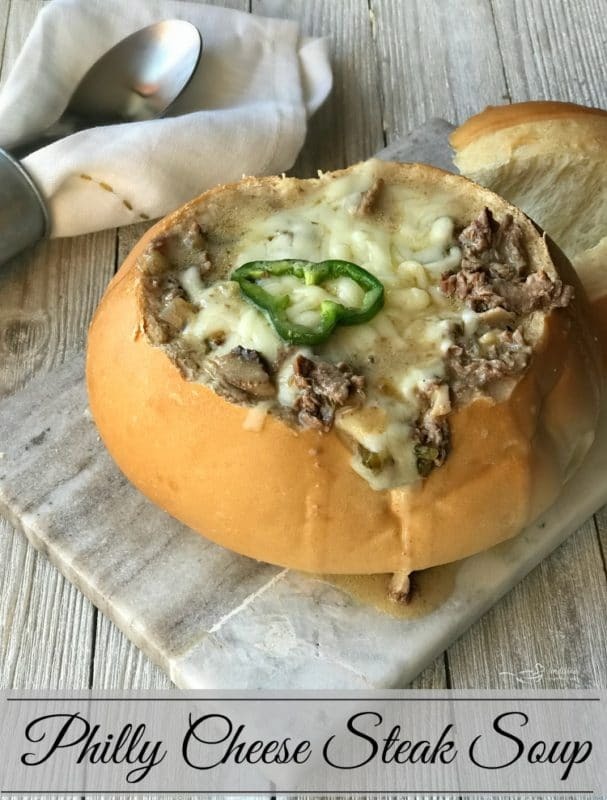 This Philly Cheese Steak Soup recipe has been developed for and sponsored by Gary’s QuickSteak, but the love and opinions I have about their products are truly my own. I have been cooking with Gary’s QuickSteak for a while now. It’s a dream come true to be able to share some of our favorite “non-traditional” ways to eat a Philly Cheese Steak! If you have followed along with me for a while, (I have been at this a long time…) You know I have quite a few recipes that a classic cheese steak is the inspiration for. 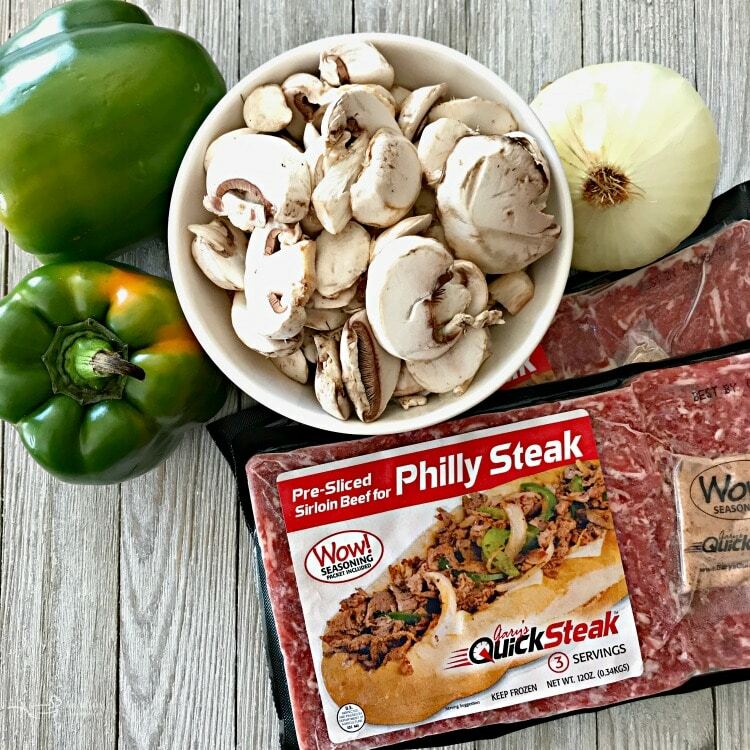 Well, I can tell you, that now – those recipes have been made so much quicker and easier, using Gary’s QuickSteak! What do I Love about Gary’s QuickSteak? Cooks from frozen in just minutes. There is only one ingredient; sirloin beef. Steak contains 23 grams of protein per serving. Steak is low in carbohydrates. Contains all of the seasoning you need in the “WOW Seasoning Packet” in each package. The packaging! Packages are slim and perfect for stacking in your freezer. You can see the product, right in the packaging. No question what you’re buying. Versatility. Options for using the steak are endless! Think outside the sandwich! How about a little back story? The story of this amazing steak, actually dates back to the 1980’s, right here in Nebraska. In the early 80’s, Gary, the founder, opened a Philly Cheese Steak restaurant, called the Chartoose Caboose. 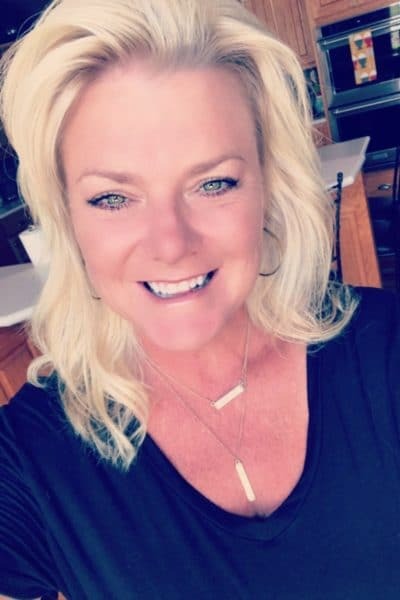 Being a Nebraska native, (and a child of the 80’s!! ) I remember this well. 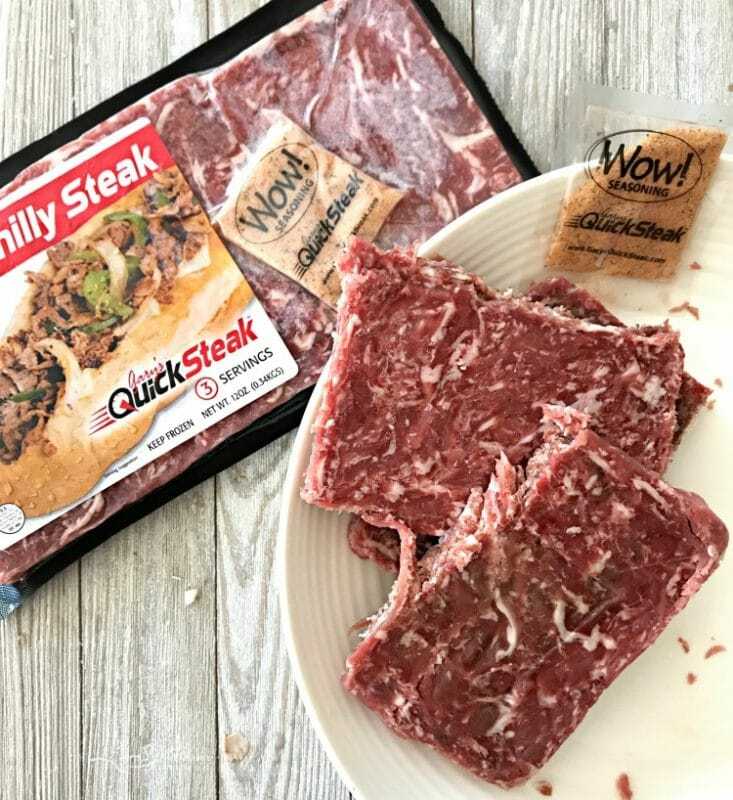 Throughout the 80’s, franchises were in 5 states, and Gary developed a method of slicing and portioning a quick release Philly Steak Meat product, known as the Steak-EZE* Puck. Gary knows he has a good thing. He sells his franchise, and invests his time processing and selling his legendary Quick Release Puck to the food service industry across Canada, United States, and Mexico, acquiring a patent in 1992. Even after retiring in 1998, Gary still had the drive to share his Philly Cheese Steaks with us all. In 2002, Gary started a place you may have heard of? PepperJax Grill! During his 14 years of owning Pepperjax, Gary started Glenn Valley Foods, the parent company of Gary’s QuickSteak. That brings us to present and me getting the chance to tell you all about this delicious tasting steak, that has become a short cut in so many recipes here in my kitchen! When I was deciding what to create, my mind was running wild with ideas! But since fall will soon be upon us, my mind kept turning to comfort food. For me, soup = comfort food. Sure, you can serve this up in a regular bowl, with some bread along the side for mopping up all of the deliciousness, or you can go all out and serve it up in a bread bowl! 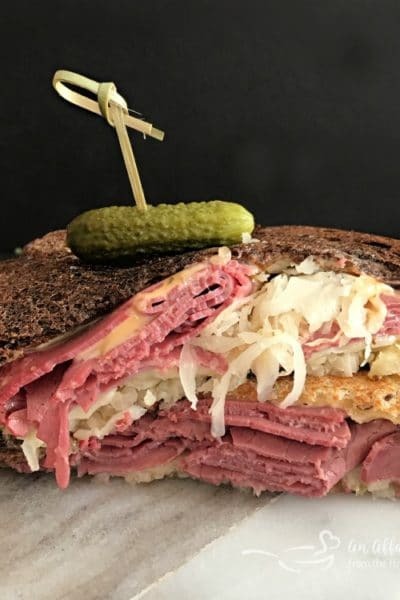 I am no expert at Keto, but I know a lot of people follow the Ketosis way of eating, I feel like this recipe would be easily adaptable for that lifestyle, minus the bread, of course. 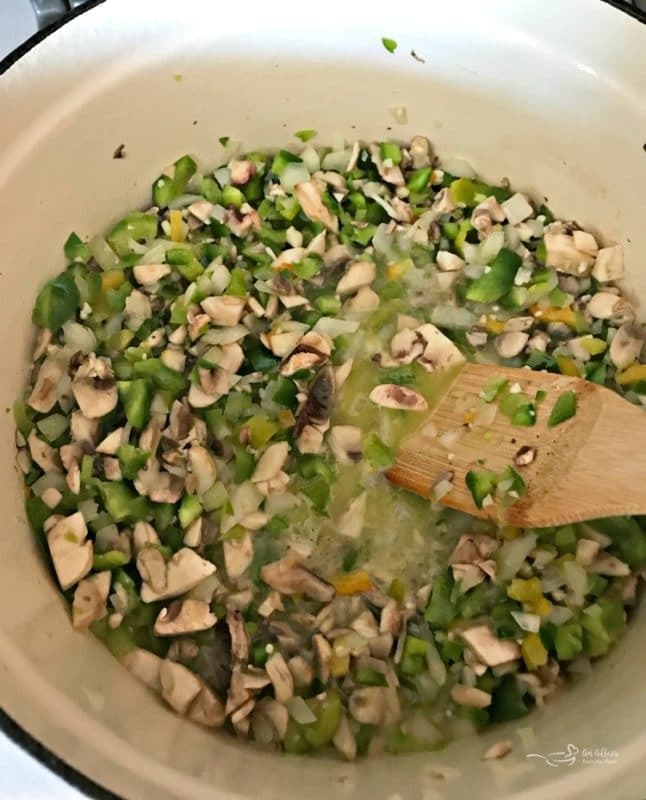 Our steak soup recipe starts with fresh bell peppers, white mushrooms, onion, garlic and Gary’s QuickSteak. In your Dutch oven, melt some butter over medium high heat. Add in peppers, onions, garlic and mushrooms. Sauté for 4 minutes. Add in frozen quick steaks + WOW seasoning packets. Continue cooking for another 4 minutes. 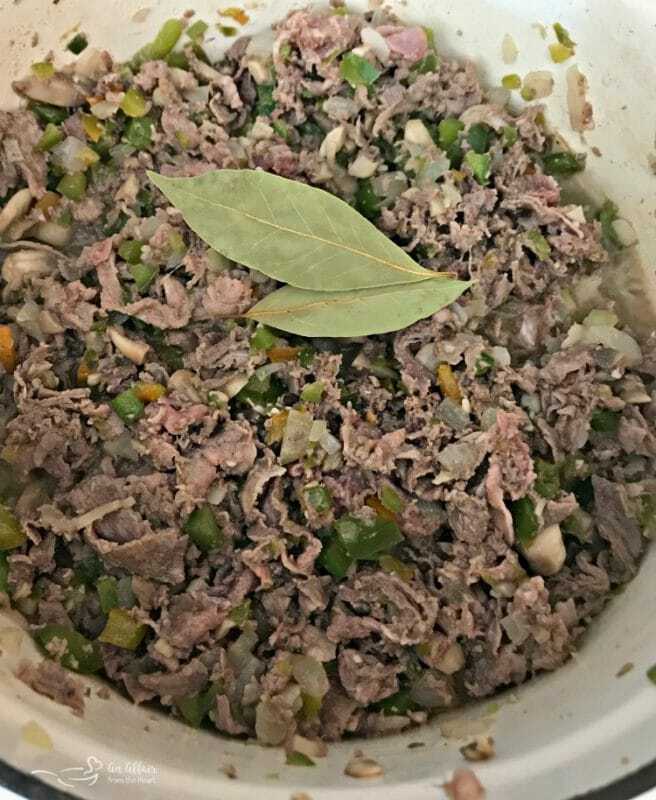 Add in Bay leaves, beef stock and bouillon cubes. Bring to boil, reduce heat to low and simmer for 20 minutes. Pepper to taste. Stir in a mixture of corn starch and water mixture. Soup will begin to thicken. Stir in cheese, until incorporated. Add in cream. Make sure to have plenty of extra provolone for topping the soup bowls. I purchased my bread bowls at my HyVee Supermarket bakery. 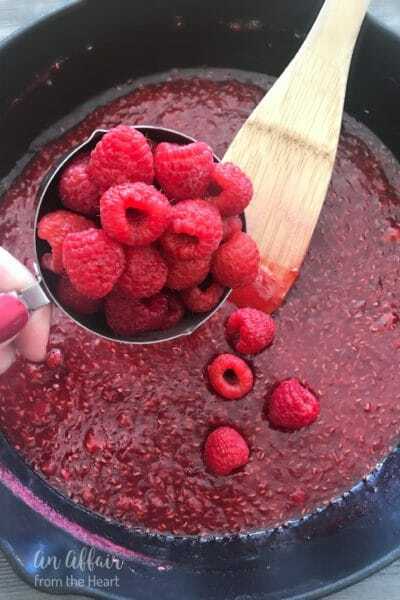 But If you’d like to make your own, here is a fantastic recipe! Are you ready to get your hands on some Gary’s QuickSteak? Check out Gary’s QuickSteak on their website for recipes, tips & ideas and locations for purchasing this amazing steak! Follow along with them on their Facebook page and their Instagram page for recipes year round! Love their products? Share your Gary’s QuickSteak photos and tag #GarysQuickSteak #MealsInMinutes – we love to see what’s cooking in your kitchens! Guess what? They also have chicken and corned beef! Stay tuned for more fantastic recipes from Gary’s QuickSteak and An Affair from the Heart! 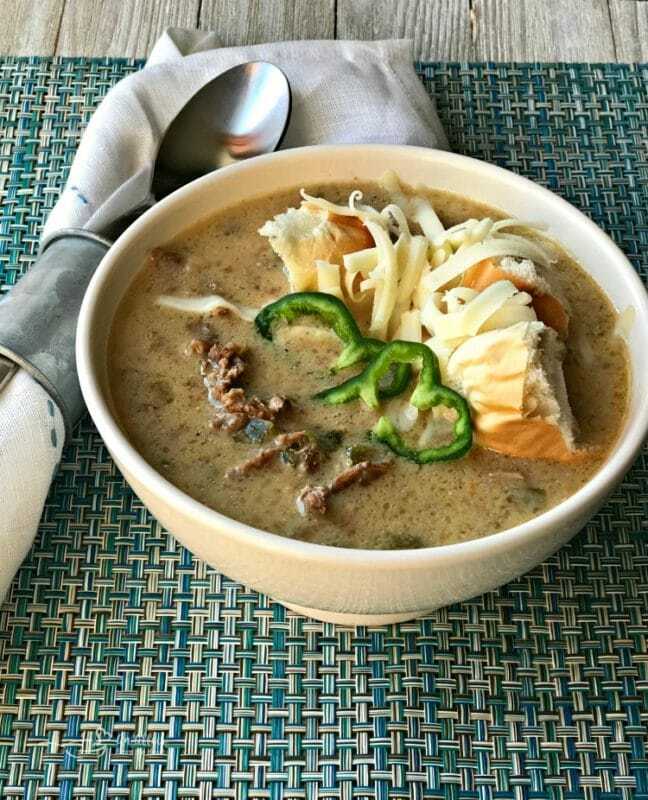 Just like that — in under 30 minutes, your Philly Cheese Steak Soup is ready to serve! 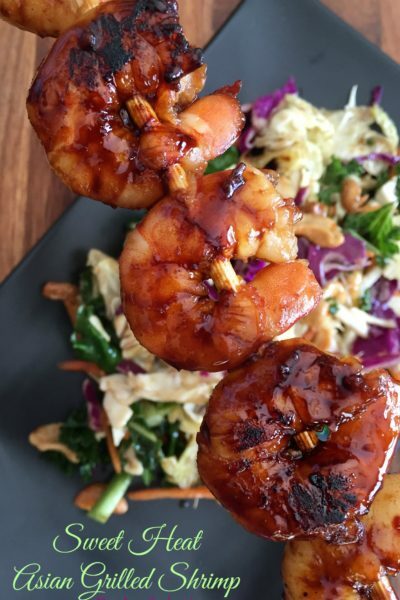 Who couldn’t use a great easy recipe like this one? You’ll have to tell all of your friends about this tasty steak soup recipe! 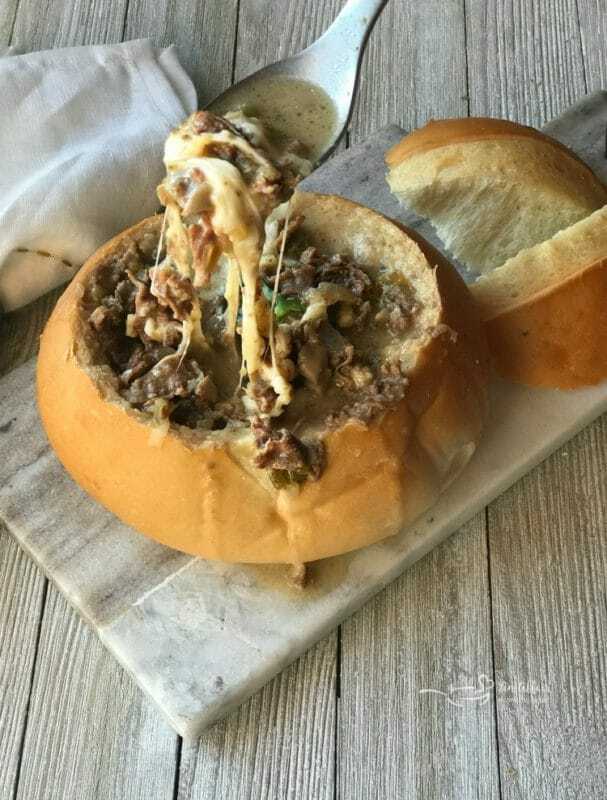 This one pot Philly Cheese Steak Soup is a family favorite. 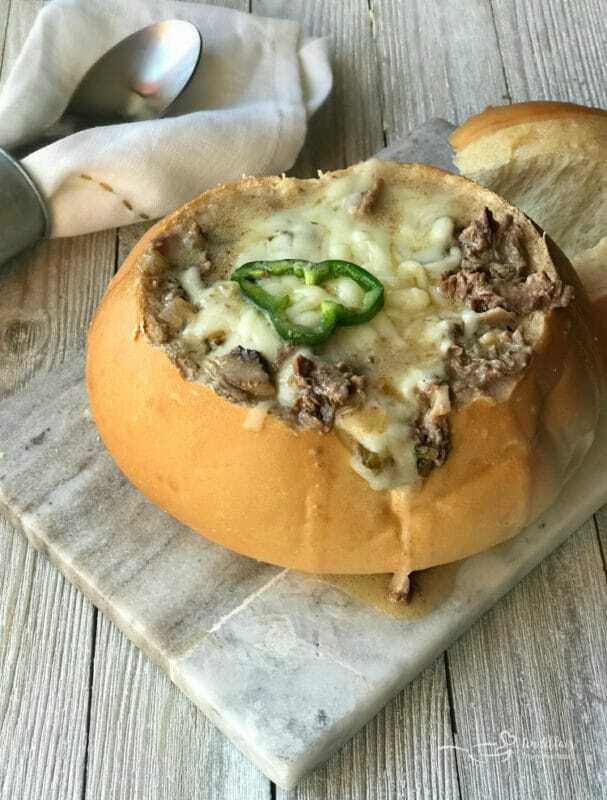 The classic cheese steak sandwich served up as a rich and creamy soup in a bread bowl. 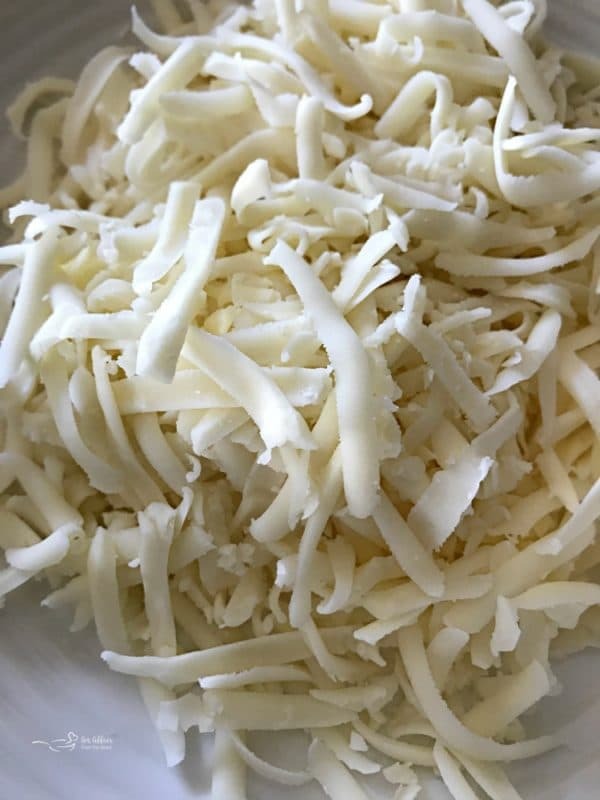 Additional shredded Provolone for serving. In your Dutch oven, melt butter over medium high heat. Add in peppers, onions, garlic and mushrooms. Sauté for 4 minutes. Add in frozen quick steaks + WOW seasoning packets. Continue cooking for another 4 minutes. Add in Stock, bouillon cubes and Bay leaves. Bring to boil, reduce heat to low and simmer for 20 minutes. Pepper to taste. Stir in corn starch and water mixture. Soup will begin to thicken. Stir in cheese, until incorporated. Add in cream. Serve hot in bread bowls with additional cheese for topping. Or in a regular bowl with or without crusty bread for dipping. Anything that makes it easier for me to get dinner on the table faster is a win in my book… I like that I still am doing real cooking with real meat in this product… makes me feel better about serving it to my family! You and I have a lot in common! 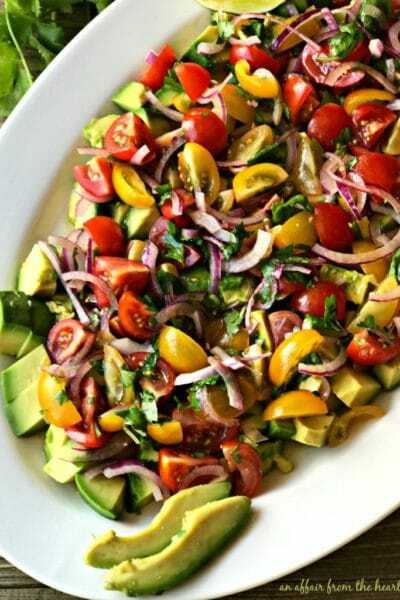 Just because you need a quick meal, doesn’t mean it has to be junk! Happy you found a new recipe to try! This soup makes me long for cooler nights! This will be perfect to serve to my family – such a creative & flavorful soup! They will be here before you know it! This soup looks so cheesy and delicious! 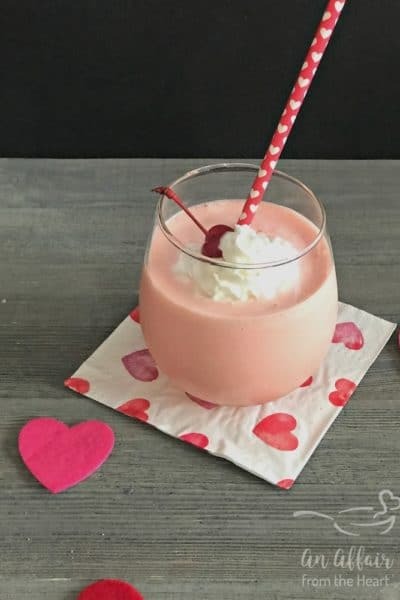 I love that it’s so easy to make also. A must for the fall season. I agree!! A must make indeed!! 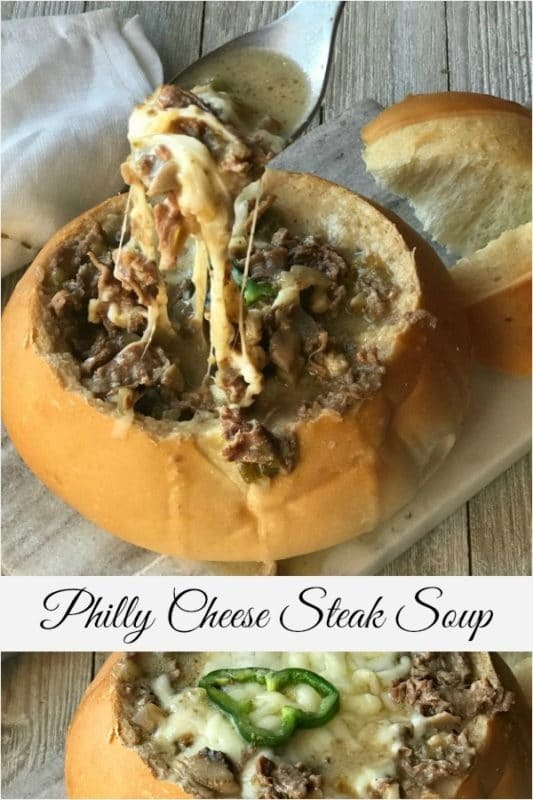 I never would have thought to turn a cheesesteak into a soup!!! The steak and seasoning really makes this so easy and hearty! My family is going to love this!!! Wow, I can see why this soup went straight to your son’s favorite recipe list! 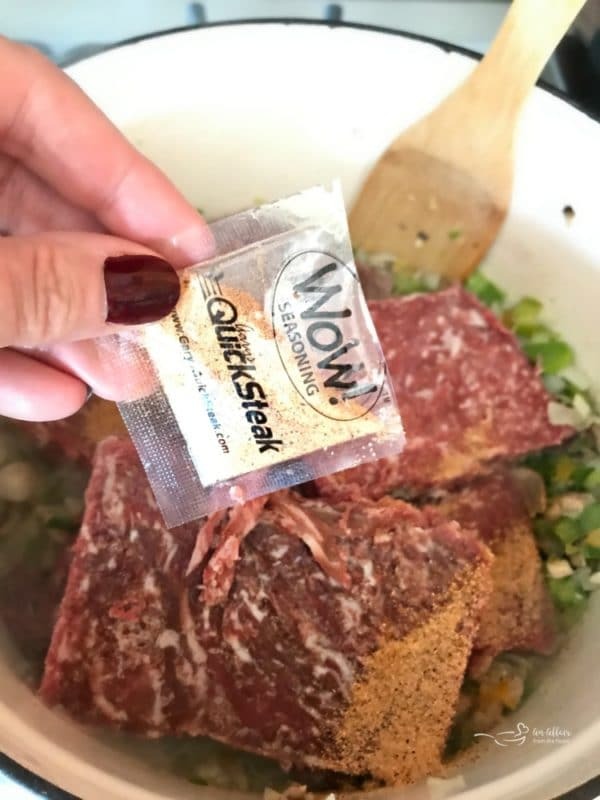 That seasoning mix with Gary’s QuickSteak sure is convenient to have all measured out. Adding this to my meal plan this week! Talk about comfort food! I can’t wait to dive head first into this soup!! You had me at philly cheese steak! (it is my weakness!) I got find these steaks here, this recipe sounds AMAZING!